The status bar is provided by the operating system and provides information such as the current time, networking, and battery status. The menubar contains access to all the functions for managing your library and the songs you are viewing. Most of the main interface displays the currently active song. There are special regions that overlay the song viewer which provide tools you can use while performing. In the lower right portion of the screen is the live bar which contains large buttons that can be activated during a live performance. These include autoscrolling, starting and stopping a backing track, starting or stopping the metronome, and toggling ad-hoc networking mode. When you open OnSong, the Registration or Getting Started screen is displayed. You can prevent this window from opening in the getting started screen once you have the information you need to make the most out of OnSong. The registration screen does not open if a menu or other modal dialog is currently open. You may also be prompted to opt into push notifications. OnSong intends to use push notifications to notify our users of an emergency or to pass along time-sensitive information. There are a few optional gestures you can use to quickly access the menubar and songs menu. 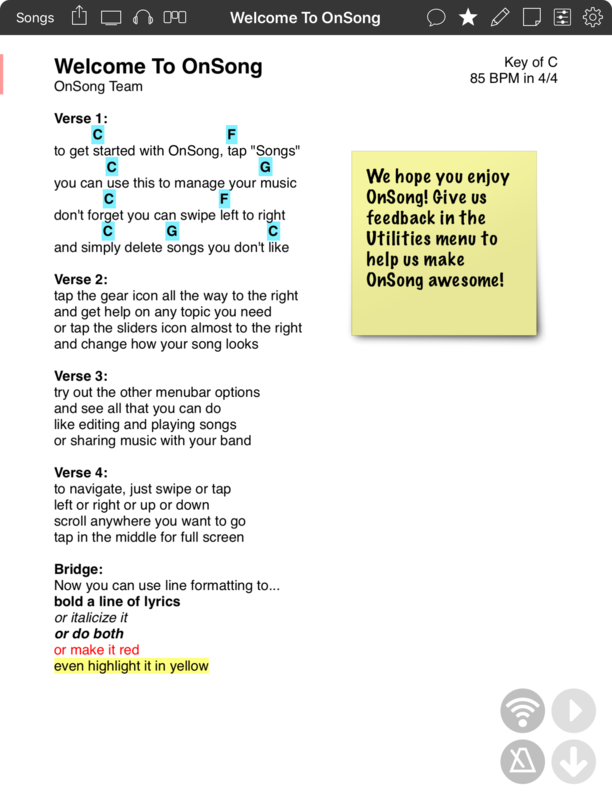 If you are using OnSong on an iPhone or iPod Touch, the user interface is different to better suit those form factors.